Kanga Cash has been launched by Wager Gaming Technology and the casino that uses the software, Liberty Slots Casino. This new online slot machine is a 5 reel and 25 payline is based on the great Australian outback. Koala Bears, Kangaroos, a Gold Panning Aussie, his Shack, his Hat and his Bucket are some of the symbols you will see as you pan for your own jackpot. The Wild in Kanga Cash is the Kangaroo and the Scatter is the Shack. The wild sill substitute for all other symbols to create winning paylines except for the Shack. The Shack, being a Scatter, is the symbol that will launch the bonus feature if three or more appear anywhere in the reels. 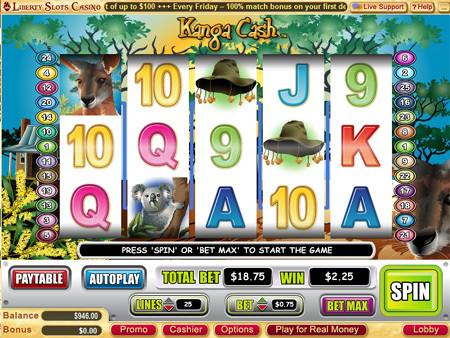 If you are lucky enough to land three or more Shacks in a spin of the reels in Kanga Cash, the bonus round will start. You will be panning for gold in a gold filled river. Grab your equipment because the more gold you find and the size of the nuggets will determine your prize. The prize is multiplied by the original wager that triggered the bonus. The new slot game, Kanga Cash, can be found at Liberty Slots Casino.